Home / Banking jobs / Vacancy / Career Opportunities at Nepal SBI Bank Limited. Career Opportunities at Nepal SBI Bank Limited. 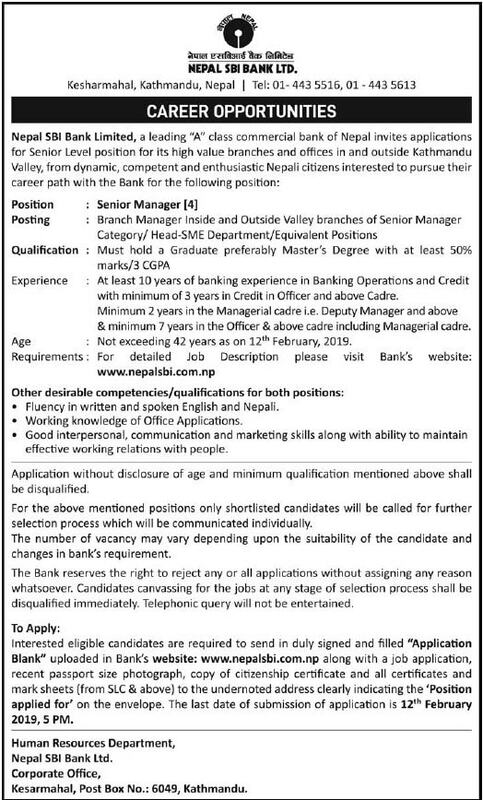 Career Opportunities at Nepal SBI Bank Limited for the position of Senior Manager. Interested eligible candidates are requested to apply for the said vacancy. Interested eligible candidates are required to send in duly signed and filled "Application Blank" uploaded in Bank's website www.nepalsbi.com.np along with a job application, recent passport size photograph, copy of citizenship certificate and all certificates and mark sheets (from SLC & above) to the undernoted address clearly indicating the 'Position applied for' on the envelope. The last date of submission of application is 12th February 2019, 5 PM.